Welcome! We look forward to seeing you! 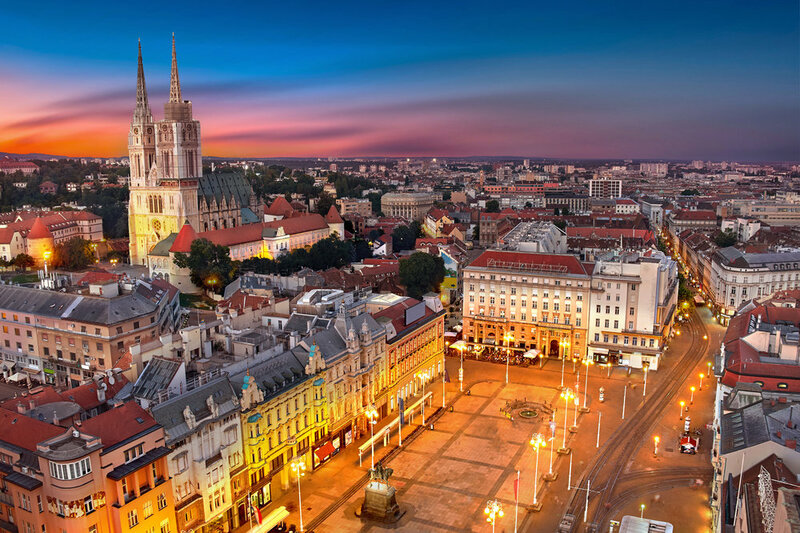 Upon arrival at the Zagreb Intl Airport, you will be met and driven to your hotel which is in Zagreb’s City Center. Here, you can relax for the afternoon/evening or perhaps take a stroll around the Ban Jelicic Square, filled with many historical features, restaurants and cafes). Our journey will begin very early the next day, so get some rest…. Nutrition begins early… Afterward, we’ll grab your travel bags, load up the van and head to the UNESCO World Heritage site of Plitvitce Lakes National Park. With your items stored safely, we will explore the national parks wooden foot pathways, marvel and photograph the numerous waterfalls and crystal clear water cascading through the forests, fauna and limestone rocks from above. It is gorgeous and powerful, a true ‘Bucket List’ location for sure. After our day of adventures in Plitvice, we depart for the 2.5 hour drive to Island Pag, our base-camp for the next few days. Destination: Novalja town, where your modern condominium accommodations are located, Ville Sunca. We typically opt to use this day as sort of a “chill day” allowing the body to settle into it’s new time-zone and environment. Here, we begin the day by boat to explore some of the most beautiful standup paddling coves, swimming the warm adriatic waters, snorkeling in epic locations and some of the freshest foods for lunch. Island Pag, known as the barren island, offers a surreal moonscape topography on one side of the island and unique starkness providing a profound serene beauty of forests, foliage and ancient olive groves on the other. The unusual landscape, as on Metanja and Rucica, is a natural phenomena occurring from centuries of the Bura winds. Unlike anywhere in the world really. We will also take a boat ride to world famous nature park, Zavratnica Bay. A stunning warm water cove where the ancient Romans once thrived. Here, we can paddleboard, swim, snorkel, relax, hike the park’s trails and simply enjoy a fantastic lunch aboard the boat too- if we choose. Sunset will wrap up our magical day on the water and we’ll head back to Novalja to clean up and grab some dinner out. Grab the hiking/walking shoes and your cameras for our next journey to the amazing underground caves of Grabovaca. This will certainly be utterly fascinating for all… After our day of exploration in the Mighty Velebit Mountains of Grabovaca and other secret locations, we head back to Novalja for a sunset swim and then an evening of relaxing. Time dependent, we have multiple options of local culture and adventure available to us, or, perhaps you may desire more late day / sunset water-time…these are the good decisions to have to make! Fun fact: Did you know that Island Pag is known for their goat cheese, sea salt and olive oil? Pag has one of the oldest olive groves in the world with some trees dating back 1600+ years. We’ll make sure to stop by and see our friend Ivan at his olive orchard and grab some of his private reserve oils too. Our last morning on Island Pag, leads us to Babe (prounounced: “ba-beh”) Beach with SUP boards for a morning paddle along the natural coves and its coastline. Afterwards, we’ll pack up and say good bye (“Doviđenja”) to our Ville Sunca friends and travel to our next destination: the world famous Hvar Island! Our destination accommodations will be at the uber chic The Grand Amfora Resort. This beautiful hotel has first-rate amenities that include a Fitness Center, Spa, Massage, Pool and Seaside Privacy decks - and it all overlooks the warm Adriatic Sea. It sits directly on the promenade and is merely a short stroll to the Hvar Town square. Hvar Old Town has excellent dining, charming wine bars and of course cafes, nightlife, a 16th century fortress, UNESCO heritage sites, super yachts the size of hotels and more… It’s all here, and you will be right in the middle of it for the next couple of days. Today, we explore other areas of the island such as Vrboska and Stari Grad. Stari Grad is one of the oldest towns in Europe and is ‘the historical heart of Island Hvar’. So charming are these little seaside villages. In the event you didn’t know, Island Hvar is known as the Lavender Island. You will notice along our island drives, there’ll be lavender shops and kiosks everywhere. This is because the Stari Grad Plain, under the official UNESCO inscription, is “a cultural landscape that has remained practically intact since it was first colonized by Greeks from Paros in the 4th century B.C.” So, we will ensure your visit there, and your Lavender oil purchases are not forgotten. Today, is our final transfer day but your journey doesn’t end yet. Today you will be immersed in great history again. Upon our early departure from Hvar, and arrival back to the town of Split, we will explore our next UNESCO World Heritage site, the Palace of Emperor Diocletian. You can not miss it in all it’s grandeur. Built in 305 AD and still open to amazement to this day. After our palace visit, we head back up north to the capitol city of Zagreb. Arriving late afternoon, early evening- and with time allowing, we may want to explore the upper town of Old Zagreb via the Funicular Railway. Here, you will find the famous St Marks Church, the Croatian Parliament, the world known, Kamenita Vrata (The Stone Gate), and one of the oldest pharmacies in Europe called “K Crnom Orlu” (“At the Black Eagle”). And as stories go, it’s where Dante’s great-grandson once worked. Zagreb’s beautiful Cathedral can not be missed also. This is a great time to do some lite shopping, take some personal photos and soak it all in. At days end, we will meet up and have our final group dinner. Here we’ll share stories of the amazing week just had and bid you a wonderful evening of private reflection. This day is all yours. Depending upon your flight departure times, you can enjoy your morning coffee in the town square, or even have a morning walk through the boutique ladened walkways. Your driver will then take you back to the airport with plenty of time to board your flights home, or to your next destination.